After a poor run of results in recent weeks culminating in the defeat at Oakwell, United simply had to win this game. Lose and the season was likely over. Wilder opted to give the eleven who stated the game another opportunity. Donaldson was on the bench instead of Wilson. United started on the attack on an evening where it was quite misty and rain in the air. Within two minutes, the home side were ahead. Fleck found Stevens who helped the ball over and the ball. The ball was cleared as far as EVANS who was around 25 yards from goal and as the ball dropped high out of the sky, he decided to try a cushioned volley. It seemed an ambitious move but the midfielder caught it perfectly and it sailed into the net past the despairing dive of Randolph who was grasping thin air. It was a genuine goal of the season contender. United continued to take the initiative and soon after Lundstram fired over. Evans then was involved again as he fed Baldock who in turn found Basham but Clarke could not get the loose ball. United had made all the running but a break from Traore saw the ball drop to Bamford but his low shot was straight at Moore in the first effort of the game for the visitors. United went back on the offensive and a lovely move just inside the quarter hour mark should have seen it 2-0. It was moved about patiently and Evans rolled in Clarke who was in on goal but his shot lacked power and conviction was kicked away by Randolph. United then were away again and Brooks who had looked lively so far, skipped away but Leadbitter cynically pulled him back getting a deserved booking. Brooks was then brought down by Ayala, a clear foul but incredibly ref Bond did not even give a free kick despite the United man needing treatment. United continued to move the ball about with Lundstram and Evans impressive in the middle and the wing backs ably supported by Basham and O’Connell. Disaster struck for Boro before the half hour mark when Leadbitter brought down Fleck. It was a clear foul and quite late and Bond had no hesitation reaching for the red card. The departing midfielder took an age to go off before trooping down the tunnel. Fleck was then booked for a slight tug before another worse foul from the opposition was not given a yellow. Clarke then went down at a corner before it was taken. He seemed to complain that Ayala was the guilty party but none of the officials saw anything. The game was threatening to boil over. Fortunately, United kept their cool and doubled their lead soon after. A short corner found Brooks and he showed lovely skill putting an opponent on the floor before checking back and chipping a well-played ball into the path of EVANS who for the second time in the game hit a delightful volley low into the right-hand corner of Randolph’s goal; once again giving him no chance. United continued to play well and some lovely moment saw the ball moved around several times with Baldock a real threat and then Lundstram and Brooks linking well. It was an excellent first half performance and the crowd rightly gave them a standing ovation at the break. Manager Pulis had seen enough and with his team with ten men and two behind, made a bold move changing three players with Assombalonga, Clayton and Fabio De Silva coming on for Bamford, Traore and Besic. They seemed to stiffen up the midfield and won a few loose balls and seemed more determined. Wright was penalised for a foul – again this seemed harsh and as the chipped free kick came over, AYALA stole in at the back post as Clarke lost him, and smartly drilled the ball low into the goal. It was a really sloppy goal to concede and Middlesbrough were back in it. United were now giving the ball away and starting to panic a bit. Howson broke and hit a shot over and then Assambalonga caused problems with his pace. United broke out briefly with Baldock doing well down the right and Basham then showing some good work at the other end. The game became very scrappy with several stop start periods due to fouls or poor play. Fabio was booked for remonstrating after Bond gave United a free kick (not against him) and several Boro players had to calm him down. Duffy was introduced for Wright as United tried to change the formation and stem the tide in a second half where they had struggled to keep the ball. Duffy ended up wide left as part of the realignment. Boro were now having a real go and started to win the loose balls. Howson then came inside after a slip from Basham and curled just wide with the crowd holding their breath. However, Evans fired over after good work down the left set up the chance. Donaldson replaced Brooks as the game ticked down and the crowd were getting very anxious matched by the home side who kept tossing the ball away. The game became very stretched and United now were clock watching as they were wary of some of the late goals they have conceded in similar situations. Boro were now launching long throws into the box at every opportunity. Leonard came on for Lundstram as the game entered four minutes of additional time. Clarke gave away a free kick and Moore had to punch away. Another long throw came in but United cleared and the final whistle came signalling a crucial win. 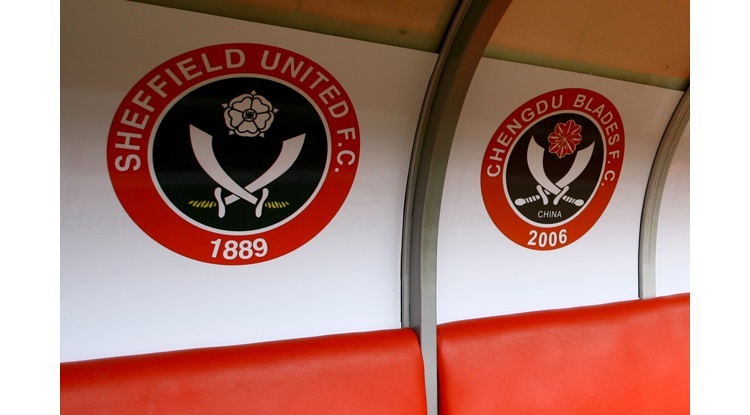 The Blades players punched the air while the opposition players slumped to the floor.